With the Oscars drawing near, I thought I should check out the movie that seems to be the front runner in the race: The Revenant. There has been a lot of talk about how difficult The Revenant was to make. Director Alejandro González Iñárritu, last year’s Oscar winner for Birdman, took his actors and crew to remote locations in Canada and South America to film the movie. Iñárritu wanted to use locations that would best resemble the remote Western U.S. in 1820. Two time Oscar winning cinematographer Emmanuel Lubezki, used natural light for his stunning winter views. Star Leonardo DiCaprio did his own perilous stunts. I certainly appreciate the very difficult conditions everyone endured to make The Revenant. I only wish I liked the movie better. The Revenant would not get my vote as best picture of the year. The story is pretty simple: A group of frontiersmen head out into remote territory. One of the members, Hugh Glass (DiCaprio) is attacked by a bear and horribly mauled. (I confess that I averted my eyes during part of this scene!) Glass barely (excuse the pun) survives the attack. The other members of the party decide to return to the fort, leaving Glass with his son and two other men, under the leadership of John Fitzgerald (Tom Hardy). Fitzgerald’s group is charged with bringing Glass back. This would be a slow and daunting task, rendering the small group vulnerable to attack from both humans and beasts in the harsh winter conditions. Aware of the risks they face, Fitzgerald attempts to kill Glass, when no one is looking, so the rest could return home. Horrified, Glass’ son tries to intervene, and is stabbed to death by Fitzgerald. Fitzgerald throws Glass in an open grave, leaving him for dead. He and his companion return to the fort, never expecting to see Glass again. Most of The Revenant chronicles the survival of Glass, and his excruciating efforts to survive and carry out revenge on Fitzgerald. The film contains little dialogue as Glass strives with Herculean effort to survive against all the unfriendly elements. The word Revenant means “one who has come back from the dead to seek revenge” and that indeed is what Glass does. DiCaprio underwent considerable physical hardships to portray Glass. That being said, it does not seem like an Oscar winning performance. Perhaps due to the lack of dialogue, I did not know what drove Glass; I did not feel his emotions. Hardy is also nominated for an Oscar as Fitzgerald. But I found that his speech often was garbled and hard to understand. Maybe that was Hardy’s (who is British) attempt at an accent for Fitzgerald, who claims to be from Texas. The best part of the movie is Lubezki’s stunning photography which, I believe, could make him the first person to win the cinematography Oscar three years in a row. 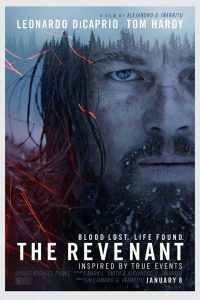 Otherwise, The Revenant is over two and a half grueling, but not necessarily compelling, hours long. The story did not seem particularly original or interesting. The whole exercise was more like an endurance test. For me, The Revenant is the kind of movie that is easier to admire for the effort it took to make it, than it is to actually like.